I haven’t been writing as much as I used to lately and I really want to change that, so I decided that from now on, I will be blogging about my monthly favorites to properly document my feelings about them, spazz tweets notwithstanding. Plus, everyone loves lists. It’s easier to stitch together your thoughts when they’re in a listicle format (yay). This blog post will be basically just me explaining why I love these things, hence the name. Ever since I finished Praia Do Futuro (which I blogged about in a separate post), the category in my Netflix movie hunt has become heartwarming gay film extravaganza, and I’m glad to find out that this work is exactly that. Holding the Man tells the beautiful story of Tim Conigrave and his partner John Caleo. The film is an adaptation of Conigrave’s memoir of the same name and it shows what transpired in the 15-year relationship between the two, who met in high school and dated until they were in their early 30s. It’s a story about coming out and embracing your gender identity during a time when society wasn’t yet as open as it is today. It’s a story about fighting for what you deserve. It’s a story about sacrifice and love. I loved every bit of this film. It’s lively, it’s domestic, and it’s absolutely heartwrenching. I was a pathetic sobbing mess by the last 15 minutes of it. I began crying again after it ended when I looked up one of the foreign phrases spoken by the characters (never mind that it was already close to 4 am when I finished it). 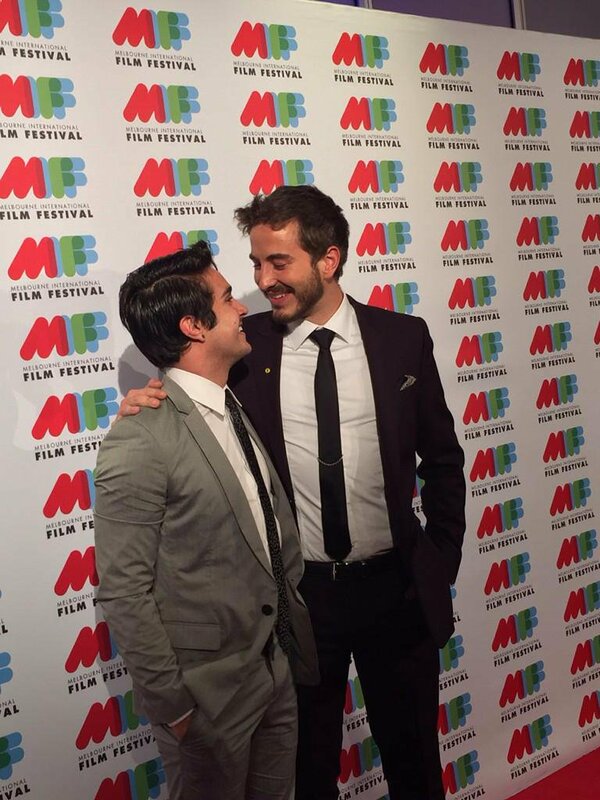 The two leads Ryan Corr and Craig Stott had brilliant chemistry. They were very tender and loving (I can only imagine how nervewracking it must have been to try to duplicate the kind of intimacy that long-time boyfriends must have had). They even have the cutest height difference. If there’s anything that I didn’t find convincing, it’s Ryan Corr playing as a teenager (because he really didn’t look like one, haha), but he makes up for it by looking utterly dashing for the rest of the movie. But I guess what really amazed me (to the point I still couldn’t stop thinking about it until now) is Corr’s performance and how he managed to be so convincing in playing as this vibrant, effeminate gay man. From the way he held himself, to the way his voice sounded, to even having that gay twinkle in his eyes…it’s just brilliant, brilliant acting. Lately, I’ve been thinking a lot about why LGBT romantic films touch me in a way straight romance quite never does and while writing this blog post, I think I finally found the answer why. The gay community takes real ownership over this film — it’s a story that honors the memory of a gay couple who lived through the AIDS epidemic after all. And while I am far from being a gay male, I was able to relate with the confusing and often terrifying moments of realizing who I am, of discovering what I want while growing up. I’ve always known this guy is stellar after watching him depict the Colombian drug kingpin Pablo Escobar in Netflix’s Narcos, but I quickly developed a renewed fascination over him after (once again) seeing him in Futuro Beach. As a result, I binge-watched all of his movies that are available on Netflix. My discovery? This guy is a real chameleon. He’s a wonderful actor who shines in every role he portrays, and you’d be left awestruck when you realize the massive differences between the characters he’s done. From a narco-terrorist to a brutal special forces captain, to a gay lifeguard and to a mad scientist…he’s done it all. One of my favorite movies of his is The Man From the Future (O Homem Do Futuro) where he essentially plays three versions of the lead character. He plays Zero, a scientist who goes back in time to win back the dream girl of his life. I know it’s summer but this is just one of those songs that feel like a warm hug that tucks you into sleep after a long, tiring day. I am terribly in love with Hozier’s music. I wish music in heaven sounds as good as his. I’ve watched this movie last Sunday morning and haven’t stopped thinking about it ever since. I’ve read every single review on Letterboxd, looked up people’s reactions on it on Twitter, watched interviews I can’t even understand (most were done in Portuguese). I’ve even created a short Spotify playlist for it because it’s what I do when I can’t get something off my mind, but it’s still not enough. So here I am, finally properly writing about it, even though I haven’t blogged in a year. Futuro Beach (Praia do Futuro) by Karim Aïnouz is a poignant and moving drama that explores the human emotion of fear and love at its core. It tells the story of Donato (played by the brilliant Wagner Moura, yes, the same actor who breathed life into Narcos’ Pablo Escobar), a lifeguard who forms a complicated relationship with a German ex-soldier-slash-biker named Konrad (Clemens Schick) after he rescues him from an undercurrent while losing the latter’s friend in the process. In the Philippines, there’s this saying that goes, “Kapag biglaan, (mas) natutuloy!” It basically means that some things unplanned are more likely to push through. I’m kind of a believer of this saying since I’ve had my fair share of experiences that were the epitome of this, but I never thought the day would come where it’ll also apply to my concert experience. Nakakaloka, teh. Angie is a 23-year old writer from Manila. Outside of writing, she likes staring at corgi butts, discovering new places to eat at, and crying. Vivo Unveils the All-new V9 Smartphone in the Philippines! tbt to that time we toured around angkor wat and it legit felt like we were in the air nation temple when we reached the main tower representing mt. meru. it was so peaceful.